What if we told you there was a secret to designing the perfect kitchen layout? What do you do when your kitchen gets too crowded? Do you order everyone out? What if we told you there was a secret to designing the perfect kitchen layout? Put down that greasy pan and sit down and listen as we spin you a tale of the best kitchen you’ve only dreamed of before now. Here’s how you can achieve the perfect kitchen layout. A Kitchen Island: When you need someplace to prepare the next home-cooked meal, you don’t need to clear a space on your counter. By integrating a new kitchen island into your kitchen layout, you have even more room to create your next masterpiece. Plus, when you have an island, you can enlist someone else’s help in chopping vegetables or peeling potatoes. Workstations: When you have a small kitchen, it’s understandable if you only want one person in there at a time. That said, let’s imagine you have a larger kitchen. One person could take one side of the kitchen to bake that peach pie you’ve all been looking forward to as someone else looks after the soup you’re making for dinner. More Seats: Finding unconventional ways to maximize the seating potential in your kitchen is another part of achieving the perfect kitchen layout; bar stools might serve in a pinch where larger chairs won’t fit. 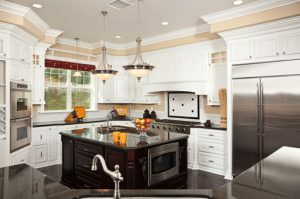 Once you have begun the process of remodeling your kitchen, the possibilities are endless. Whether you want some new paint, floors, or lighting, those are all important pieces of the puzzle. Equally as important, however, are your kitchen appliances and fixtures. Add more sinks into your kitchen, or think about getting a new stove and oven combo if the one you have now just isn’t working out for you – perhaps switching from electric to gas could be the solution you need. Don’t overlook the importance of a high-capacity dishwasher as part of your perfect kitchen layout – after all, nothing is more frustrating than doing several loads of dishes in one go just to see the sink mounding over the next day. More Kitchen Ideas for Your Next Kitchen Remodel! This entry was posted on Thursday, April 26th, 2018 at 1:10 pm. Both comments and pings are currently closed.